Top 4 Strength Training DVDs for Women Revealed! If you are looking for the best strength training dvds for women, then you are in luck. Read on to find out our top rated selections. Women of all ages do not only want to lose weight but also want to get stronger and fitter. But it’s important to choose a program that will fit the specific needs of your age group. Younger women in their 20s will perform differently than those in middle age, and they’ll both perform differently than seniors. There’s no reason to exclude anyone from the arena of strength training. So we’ve chosen the best strength training DVDs for women in each age group to make sure you get the most effective and most appropriate workout for you. The best thing about XTFMAX is that you don’t need much workout equipment, only a pair of dumbbells or a set of resistance bands. This means you can save money, and your workout gear doesn’t take up much space in your living room. XTFMAX is designed to help you build strength fast, with intense workouts that are only 30-45 minutes each. Even someone who is already relatively fit can increase their strength from this program, and the exercises are varied enough that it stays interesting. XTFMAX comes complete with a workout calendar, training guide, and a nutrition plan that will help you to burn fat while you tone your lean muscle mass. PiYo is a fantastic program that focuses on strength and flexibility, and the only equipment you need is a yoga mat and a bit of space. These fast-paced 25-45 minute workouts 6 days a week will help you shed excess fat and increase muscle. They also help to combat the stiffness and decrease in flexibility we can face from sitting in an office all day. This program is great for beginners and fitness enthusiasts alike, since you can vary the intensity to your level of comfort. You don’t need any prior experience with strength training exercises or yoga, since the program will teach you everything you need to know. Each round of PiYo lasts 60 days, so you can see fast results. They even include an easy food guide so you can get the best results possible without feeling deprived. 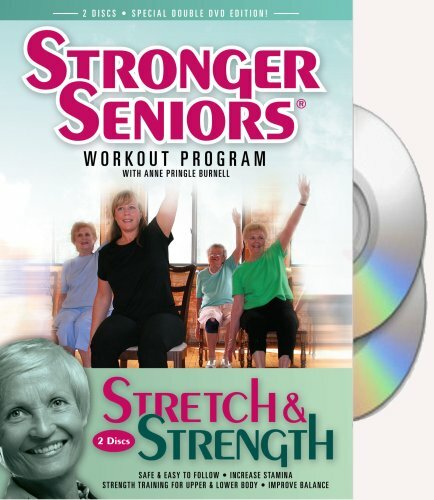 Stronger Seniors® Stretch and Strength DVDs- 2 disc Chair Exercise Program- Stretching, Aerobics, Strength Training, and Balance. Maintaining muscle strength is important as we age, but we have to give considerations to the ways our bodies change over time. In this workout series geared specifically towards women in their 50s and 60s, you’ll work on building and maintaining strength, flexibility, and ease of motion while also focusing on exercises to build bone and joint health. Taught by a certified fitness instructor with extensive experience in helping aging adults, this low impact program is fun and gentle. It is also very effective in helping you to build the muscle you’ll need to stay healthy and strong for decades to come. These DVDs are best for those with less experience in the fitness world, though it would also be great for maintenance for those with a stronger fitness background. 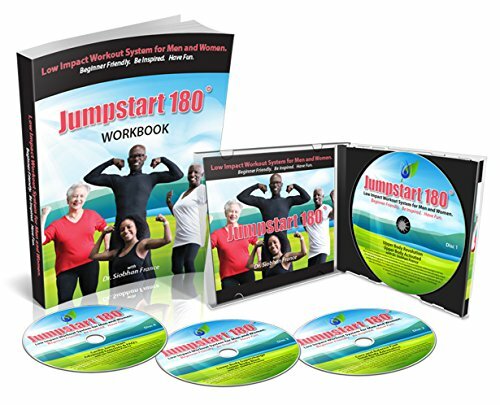 This DVD set is ideal for seniors who are just getting started in fitness. These all low-impact routines are geared towards anyone with impaired mobility, chronic pain, heart disease, and those who have had recent surgeries or joint replacements. The program addresses not only building strength, which is essential for longevity, but also helps to build cardiovascular endurance, balance, and flexibility. Those who use this program can move at their own pace and adjust the intensity as needed. There is a workbook included so participants can track progress towards their goals, and it helps you to stay consistent. Both individuals and groups can make use of this DVD series too, so you don’t have to work out alone. The instructions are easy to follow, and are led by a physician who has extensive experience in helping seniors improve their physical fitness. Each of these workouts will be challenging for your specific needs, so expect it to be hard, and don’t be afraid to push yourself within the limits of safety. Make sure you do each of the exercises they include with proper form, and if it feels like it’s too much for you, you can always scale back the intensity or pause the DVD until later. If you stick with any of these best strength training dvds for women, you’re sure to get results. And choosing programs geared towards your age group will make sure you get the best exercise possible.